Boston is an old, coastal city which, through its 350 or so years of history, has been exposed to storm surges and flood risks. But, as recently described in the Third U.S National Climate Assessment, these risks are likely to become more frequent and challenging as a result of climate change and sea-level rise. City planning here, in common with other coastal cities, is placing a great deal more attention to making infrastructure and services more resilient to these impacts. A Climate of Progress, was first published in 2011 and is currently going through its scheduled three year update (due to be released in late 2014). It is the city blueprint for reaching greenhouse gas reductions of 25% by 2020 and 80% by 2050 (baseline: 2005) and to ensure that Boston is prepared for the impacts of climate change. Climate change preparedness goes beyond city infrastructure and must embrace urban social, education and health services. Health care came to the top of my attention while attending the annual Ceres conference during April 29-May 1. One workshop outlined expected sea level rise impacts in Boston and featured how some companies are building their defences, and resilience, to deal with the big storms to come. Hubert Murray, Manager of Sustainable Initiatives with Partners Health Care Inc. talked about Spaulding Rehabilitation Hospital during one of the workshop’s. Later on that day, the facility design came into clearer view from the bows of a whale watching ship as we toured the harbour. The party was joined on board by Brian Swett, Chief of Environment, Energy and Open Space, and other city officials, to talk about the challenges Boston has and how it is rising to these. 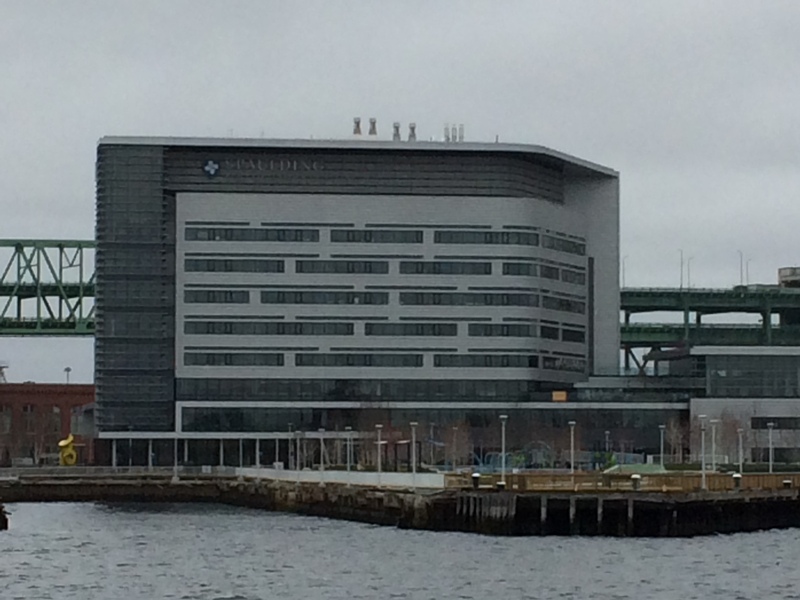 As can be seen from the image above, Spaulding Rehab is right there on the harbour front, constructed on a remediated brownfield site in Charlestown Navy Yard. It’s a location like many in Boston- highly exposed to storm surges. 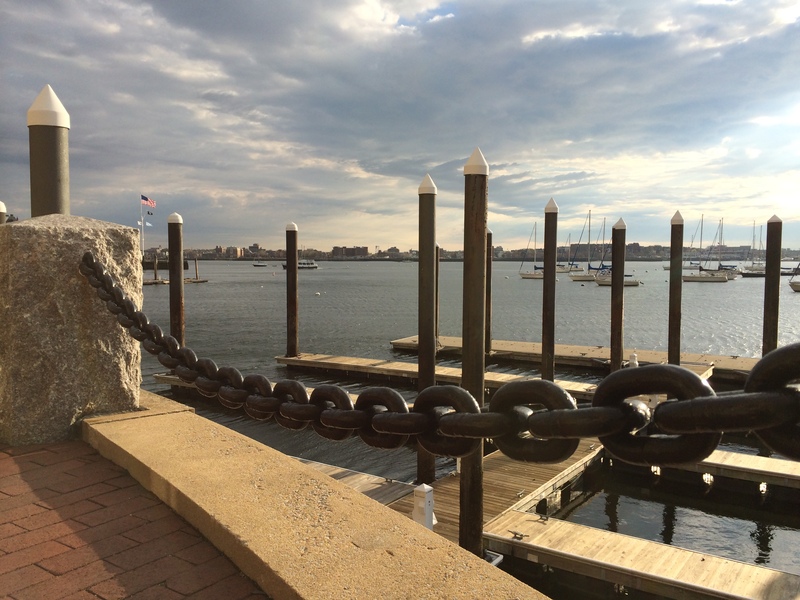 But, as Brian Swett pointed out on our harbour trip, Boston is not planning on moving back from the water front. Sea front real estate is a valuable commodity and the city is introducing measures into buildings that make them more resilient. When the hospital opened up for patients in 2013, its designers had carefully taken into account the experiences of other health care centres in New York City (NYC) and New Orleans that suffered during hurricanes Sandy and Katrina respectively. Patients at the Memorial Hospital in New Orleans, desperate to get out of sweltering hot wards, resorted to smashing windows with furniture in their storm of 2005. The LEED Gold certified Spaulding hospital has windows that can be opened from the inside. Power failures in NYC hospital buildings during Hurricane Sandy in 2012 motivated the Partners Health Care company to put their electrical and mechanical facilities on the roof rather than down in the basement. All of the patients are housed above ground floor and the emergency services are positioned on floors above the predicted 100 year floodplain. As Brian Swett put it, “We can build better buildings that are more resilient..(and) making them more flood prepared.” Spaulding Rehab’s new design is a good fit for both its time and place.